Random Thoughts of Gil Camporazo: Senator Zubiri's Resignation, Well-Founded? In a recent outpouring of "alleged witnesses" on election poll fraud which seems tainted Mr. Juan Miguel Zubiri's status as an elected senator with more than 11 million votes in 2007 senatorial election, the Senator spared no time but tendered his resignation this day in his privilege speech before the august body of the Senate. The senator claimed that those accusations hurled against him by his opponent were "baseless." Thus, he was forced to resign. His career as a statesman was affected. His family, his integrity and dignity were also affected for such false accusation "without mercy and compassion" and trial by publicity. Those things are "unfounded" and "systematically divided the nation"and making the "electoral system" dubious before the Filipino electorate. He didn't want his name to be soiled as a legislator. His honor "is something that should never be subject to taint." Now he's ready, prepared to resign for his "family suffers" with him and with the Senate as well. Last part of his speech states: "I have seen and felt the suffering of my family, and from the burrows of my conscience, I could not allow this to happen, let alone be tolerated. "They do not deserve to suffer the consequences of my position." "I now go to live in happiness and peace with my family. I will leave the Senate with my head held up high, knowing that despite all endeavors that came my way, I was able to survive and perform, and I did so with the support of those who believed in me and my advocacies. "But let me just emphasize to my detractors, as I paraphrase a quote from General Douglas MacArthur that: I am not actually retreating; I am merely advancing in another direction. "And as I now pronounce my joining the civil society, it is my humble prayer that this Institution allow me to resign with honor and dignity." Zubiri was proclaimed as 12th senator during the 2007 elections with 11,005,866 votes, but his victory was questioned before the Senate Electoral Tribunal (SET) by the young Pimentel, son of former Senator Aquilino Pimentel Jr. The younger Pimentel – who ranked 13th with 10,987,347 votes. This is the first time in the history of the Philippine Senate that a incumbent senator gave up his seat for an election controversy. For an update, he told dZMM's "Pasada Sais Trenta" that he never cheated in 2007 senatorial election. His winning in Mindanao was just a "legitimacy question." 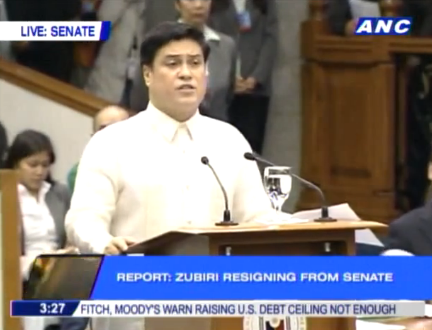 What do you think Sen. Zubiri's resignation?